THE SPARK is out today, at last! Here’s the Amazon link! This book has been a long time coming, and I’m going to have more thoughts about just how long later in the week. For today, though, it’s time to celebrate! I feel like I ought to have a ritual for today, some kind of combination of words and actions to ensure that things go right. It’s probably my theater background. See, theater folk are superstitious. And I mean, really superstitious. In high school, we were reading “Macbeth” in English class, and I happened to mention the name of the play in the theater’s green room. “You can’t be serious,” I protested. But of course, he was. There was some disagreement on what, exactly, I had to do while I was outside, but I wasn’t allowed back in the theater building again until I’d done it. It was, to be fair, kind of a spooky theater. When the curtain was closed, the stage could get very dark. For one show I delighted in lying down and staying perfectly still in the darkness, and then, when someone hesitantly tried to cross the stage, saying “Don’t step on me!” It scared the hell out of them. I got an award for it at the cast party. That theater building was also haunted. There was a rumor of a kid who had killed himself in the creepy concrete basement under the stage. There was a door to nowhere in there, and that was where the ghost was supposed to live. I once did a production of “Kiss Me, Kate” for my town’s summer theater program, and all I remember is that there were a lot of complicated dance moves that I, a notoriously uncoordinated teenager, had to learn. One of them was this weird sequence for “Another Opening, Another Show” where everyone on stage did a fancy sequence with their feet and hands. It was drilled into me so often that I still remember, twenty years later, how to do most of it. Anyway, before every show at my high school’s theater I would lie down on the stage and clear my mind. Then I would do the “Another Opening” song and dance in some quiet part of backstage. Then, last of all, I’d go downstairs and ask the ghost if it was okay if we did a show, and would he please come and watch. Everything settled, the show could then go on. That’s kind of how I feel as another book release draws near. I should have a ritual. Something to make sure it all goes according to plan. Maybe I can find a part of the house to do the “Another Opening” dance in, if I can remember all the steps. Or maybe I can just refresh Amazon’s sales page obsessively, and call that tradition enough! I don’t like being one of those bloggers whose every post begins with “I meant to update more” but here we are! I’ve been busy with all kinds of things. In mid-March I was in a terrible writing slump. I had finished the edits on my last manuscript and was at loose ends, without a new project. The projects I had to do all seemed uninviting. So I complained to my wife that I had run out of creative energy. She suggested I take a little time off, and that I’d be fine soon enough. I wasn’t convinced. I was sure that my well had run dry, that I only had a few books in me after all, and that I’d never manage to finish anything ever again! I’m sure you can imagine what happened next. The following day I started writing a scene about a character named Siphane (pronounced SIFF-a-nee) and her cool life on her cool ship. A few days later I realized I’d started something new. And now, two short months later, the first draft of MEMORY’S FIRE is done. My wife has informed me that she told me so. She’s right. The draft clocked in at 74,500 words, which is right in the middle of what I usually manage on the first time through. I tend to sketch during the rough draft and fill in the details later, and that’ll happen this time as well. I’m guessing it’ll end up at around 90,000 words when all is said and done. This is the fastest I’ve ever finished a manuscript with the notable exception of BROKEN, which was a) a lot shorter and b) done for NaNoWriMo. I’m very pleased, and I’m looking forward to editing it into something good! You saw the cover for THE SPARK, right? Isn’t it cool???? There’s some plans in the works for a Western Massachusetts launch party for THE SPARK. More on that later! It’ll probably happen in the early Fall. Still nothing official I can announce about THE DAUGHTER STAR yet, but hopefully soon. I do have some news about various short stories, but I can’t tell you any of it yet! ALSO SOON. My current projects are working on editing MEMORY’S FIRE, short story writing, and working on the second Marta Grayline (DAUGHTER STAR) book. I also have some cool ideas for another fantasy book, but they’re still rattling around my head. I’m taking a break from the Extrahumans series for a little while to concentrate on other things. Ever since BROKEN was published, I’ve noticed that I’ve become… productive. Really. My previous output was two drafts of books written in about four years. Counting the draft if THE SPARK I finished last night, I’ve started and finished two drafts in about six months (though, to be fair, the first few pages of THE SPARK were written two years ago, I just had no idea what to do with them). Something about being published has made me want to write more things. People are reading what I’m writing, so I’ll write them more things to read! I’m sure part of this is that I’m not spending hours each day writing for and managing a political website; that ate a tremendous amount of my time and energy. But really, I got such a boost of energy when BROKEN came out that I haven’t stopped writing since. The result is two drafts that I think I can shape and edit into halfway decent books. When my old writing teacher said to keep writing, she really wasn’t kidding. In any event, it looks like it’ll be a long time before you’re all rid of me. I don’t have a first draft to work on for the first time in a while, so now I can do nothing but edit and plot out what I want to write next. Yesterday, I left work at 3pm (leaving early because I opened the library) and decided to walk over to my wife’s workplace, about a mile and a half away, in another part of Springfield. We carpool, and she had the car. I thought about staying, there was a severe storm out there that might hit the city, and there was a tornado watch in effect. This being Massachusetts, though, I didn’t take the tornado warning seriously. Why would I? Tornadoes are a once-in-a-generation event around here. I mostly worried about being caught in the rain. I walked as fast as I could through the humid, gray, windy afternoon. The streets were oddly empty of people; everyone was staying inside. I made it without incident, though it got progressively darker, more humid and windier as I drew nearer. I got into the car and emailed my wife. I was half an hour early. She suggested I come wait inside with her, just to be safe (this is a very small car, mind you). I agreed. We watched the weather on her computer, and decided to wait for the storm to pass before trying to go home. The tornado watch changed to a tornado warning. At some point, their boss came out to tell us a tornado had been spotted crossing the Connecticut River downtown, only a few miles away. We headed for the basement, and spent a tense few minutes in an interior room there. When we emerged, it seemed like nothing had changed. We got into the car and started driving home. A few branches were down here and there. Emergency vehicles streaked down the streets I’d walked. I worried about the college and my friends there, but we decided just to get home. When we got downtown, more visible signs of damage appeared. Traffic slowed to a crawl, and we soon discovered why. 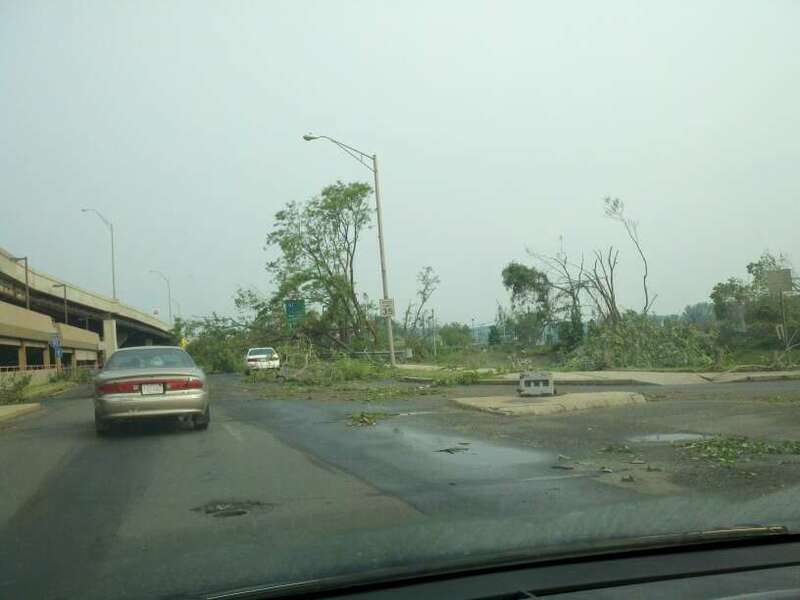 Many of the streets leading to the highway were blocked by downed trees. We finally made it to the highway, and as we drove south I caught a glimpse of a building with its roof off. We still didn’t comprehend the real damage the storm had caused until we got home, and could see the pictures coming in over the internet. This gallery from the Hartford Courant shows serious damage in Springfield, West Springfield, Monson and other places. The college where I work suffered damage, the tornado passed right through campus. One of our dorms looks like a bomb hit it. 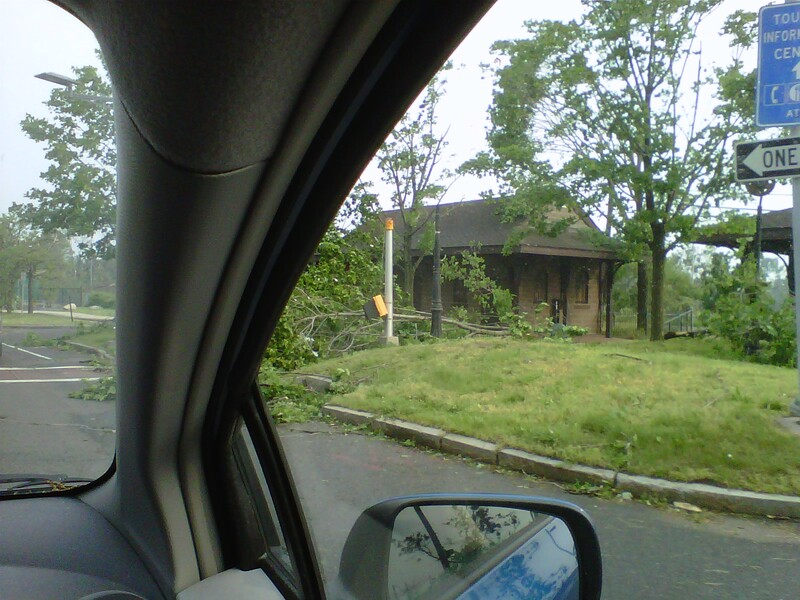 Trees are down, including several well-loved landmarks. Across the lake from the college, houses are said to be sliding down the hill into the water. The neighborhood around the college was especially hard hit, this video was taken on a street very near. I walk or drive there every day, and I was shocked to see how bad it was. Apparently people are sheltering in the MassMutual Center, a hockey arena, downtown. I hope they’re all safe. We spent a few more hours last night worried about strong storms heading our way, and retreated to the basement with the cats when the skies turned yellow in advance of a nasty-looking cell. Thankfully, it turned out to be nothing. Today, we’re both staying home. The college is closed until further notice, and it seems smart to keep people off the streets in any case. I have no idea when, or if, things will get back to normal there. I thought at the time that it might have been foolish to walk to my wife’s workplace while the storm brewed. It turns out that I unintentionally made the best choice I could have. If she had come to pick me up, we would have been there right at the time the tornado was ripping through our route home. A co-worker on Facebook posted a harrowing account of a close encounter with the funnel while in her car. And I’m glad I went inside, and that we decided to wait out the storm instead of driving home. In the end, it came down to pure dumb luck. Sometimes, that’s just the way it goes. It could very easily have gone the other way. Thanks everyone who was worried about us, we’re fine. People in Springfield aren’t, though. The damage is even worse than what you’ve likely seen on the news. Keep them in your thoughts, okay? And when a tornado warning is issued, take it seriously. This past week I hit a psychological milestone on one of my works-in-progress: 50,000 words written. Hooray! I told Twitter all about it and had a celebratory drink. Of course, the story’s not nearly finished. We’re just now getting in to some of the major action! If I had to guess, this one will clock in around 80K words, maybe a bit more, but there’s really no telling. Word counts are interesting, but stories take as long as they’re going to take, and books are as long as they are. The word count is usually irrelevant. I know this, intellectually. And yet! 50K has fixed itself as a major goal in my mind. I think I may blame NaNo for this. I did NaNo back in 2004, (the result of that became BROKEN, which in its final form is a bit under 60K words total), and since then I’ve always thought of 50K in a work-in-progress as some sort of monumental, awe-inspiring, chisel-it-into-a-stone-in-the-desert achievement. When I hit that magic number during the first draft of FLY INTO FIRE, I thought, yes, this might really get finished! And now that I’ve done the same for this work-in-progress, tentatively titled THE DAUGHTER STAR, I’m starting to think that I may have a third novel in me after all. Now that it’s past a certain point, it has a much better chance to survive. This might be one of the better things that NaNo does by setting that rather arbitrary 50K finish line–once that goal is reached, the work suddenly seems a lot more solid and official. It’s here, it’s past that first big hurdle, and finishing it suddenly seems a lot less daunting. Of course, now I actually have to do so. I’d better get back to writing. 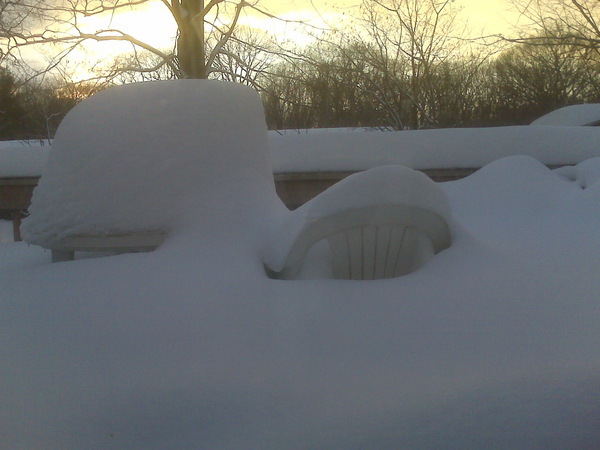 It’s another morning in Connecticut, which means more roofs have collapsed from the hideous, crushing weight of snow sitting on top of them. This is getting to be a familiar pattern. Get up, check the paper, see the latest list of casualties. Today it was a gas station canopy, which just sort of… fell over. Good grief. All of this means that, with our usual dose of Connecticut good cheer and optimism, we’re convinced that our own roofs will cave in very soon and kill us all. I was trying to get some sleep during a period of high winds yesterday, which always leads to a certain amount of house-based creaking and groaning. As I lay there, listening, I was convinced that every tiny noise was a harbinger of my own imminent demise. Me: Oh god. It’s finally happening. This is it. I haven’t even finished that book draft yet. Me: When the roof starts collapsing I’ll leap out and roll under the bed. Maybe I should do that now. Or would that just look silly? Me: Or maybe I’m just paranoid. I slept lightly, for some reason, which means I’m not in the best mood today. I don’t think anyone around here is, which means that this next week will be a perfect time to hear all about how the state is cutting back on services and raising taxes. 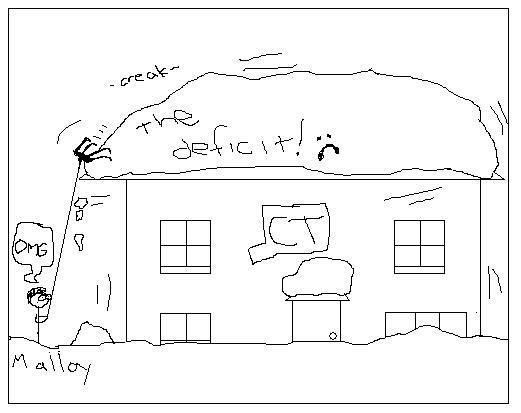 If I were some clever editorial cartoonist or had any drawing talent, I could make a cartoon that showed the snow piling up on a building labeled “Connecticut” and label the snow “The Deficit.” Then maybe I could show Gov. Malloy below with a tiny roof rake saying something witty. So to sum up the state of the state, everything is terrible, we have no money, it’s cold, and our roofs are all caving in. I’d wish for an early spring, but that would probably just mean a flood in my basement. I decided to ditch my old LiveJournal account because, man, I love WordPress way too much not to want to come over here instead. There’s a lot more that I can do with a WP.com blog than with an LJ. I want to create kind of an all-purpose place for me to exist on the web where I can keep folks informed about everything I’m doing, from political writing at CT News Junkie to more memoir-ish nonfiction at 30pov.com, and, of course, longer fiction works like BROKEN. So welcome! Take a moment to say hi.